It doesn’t take a genius to know that Duncan Keith is good. But few people actually appreciate how impressive his career has been thus far. During the Stanley Cup Playoffs last year, I said there was no way the Blackhawks could sustainably ride their top 4 defensemen as much as they did, and still have enough gas left in the tank to win the Stanley Cup. They were playing a nearly unprecedented amount of minutes (80% of the total TOI for defensemen) through the first few rounds. Well, I was wrong. They did it, and it was done on the back of Duncan Keith playing over 31 minutes per game. His ability to conserve his energy and remain highly effective while playing over half the game was nothing short of remarkable. His ability to dictate the pace of play and distribute the puck is extremely rare. It was at that point that I started digging into his accomplishments, and truly began to appreciate exactly how rare his accomplishments have been. 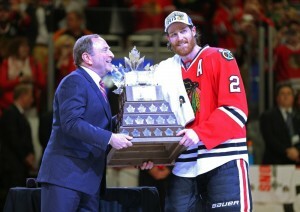 In my opinion, he is the most important player on the Chicago Blackhawks. More important than Patrick Kane, and more important than Jonathan Toews. 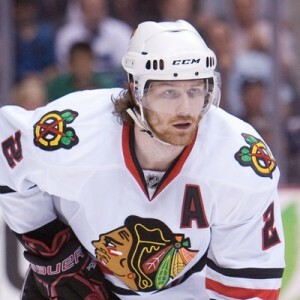 Without Duncan Keith, I don’t think they win a single Stanley Cup. Without one of the other two, they still win one or two, but probably not three. Over the past five years, I consider him to be the best defenseman in the NHL. Better than Karlsson, Doughty, Chara, Weber, and Letang. One important thing to remember is that Keith’s career is far from over. He’s only 32 years old, and he and the Blackhawks have showed no signs of slowing down any time soon. There’s a very good chance that Keith could add another Stanley Cup, and possibly another Norris Trophy victory. At the very least, he will add some impressive scoring finishes among defensemen, and some strong Norris Trophy voting finishes, even if he doesn’t win. There are seven defensemen in NHL history that have been the clear cut #1 defenseman on three Stanley Cup winning teams. Six of them are top 10 defensemen of all time (Nicklas Lidstrom, Larry Robinson, Doug Harvey, Red Kelly, Denis Potvin, and Paul Coffey). The other is Duncan Keith. All of the others were first ballot Hall of Famers. Only nine defensemen in history have won the Conn Smythe trophy for playoff MVP. Keith is one of them. Among those nine, only five have won multiple Norris Trophies. Keith is one of them (Bobby Orr, Brian Leetch, Lidstrom, and Robinson are the others). All were first ballot Hall of Famers. Only 13 defensemen have won multiple Norris Trophies. Eleven were first ballot Hall of Famers. The other two are Duncan Keith and Erik Karlsson. In addition to his two wins, he finished in the top 13 in Norris voting another six times. That’s eight total seasons finishing in the top 13. Only 22 other defensemen in history can claim that. At a minimum, Keith will add another top 10 finish in Norris voting this year. I don’t think he’ll win, but he’ll get a good number of votes. He’s currently enjoying his third best offensive season yet on a per-game basis (.69). In his two seasons that were better (2009-10 and 2013-14), he won the Norris Trophy in both seasons. Keith is at his best in the playoffs, where he elevates his points per game to .64 from .55 in the regular season. In NHL history, there are only 14 defensemen who have maintained a playoff PPG of at least .64 while playing at least 100 career playoff games. I could keep coming up with different ways to say Duncan Keith is special, but I think you get the point now. If anyone suggests that Keith is anything but a surefire first ballot Hall of Famer, show them some of these statistics.